With the new amp on the way I need to think about getting an ABY switcher. Two that have caught my eye are the Radial Tonebones and the De Lisle switcher. Have you had any experiences with either of them, or any other one you’d recommend? Get a Lehle, best on market! That doesn’t seem to have the option to ground lift or a toggle for amps that are out of phase. It just does it regardless. Edit: Sorry it does! Didn’t see the buttons! I owned the Radial Twin-City Bones and found it excellent for this application. Built like a tank in British Columbia. Whatever you settle on, I would advise to get an active (powered) unit for the buffer. It really helps keep your tone alive in the 'Y' setting. What do you mean exactly? Like power supply? There is a Radial unit that doesn't require power. It's good too. However, I like the Bones unit because of the buffer in it. This is a signal boost which doesn't matter as much on the A or B settings. But when you split your signal to two amps, the buffer will boost the signal to compensate for any tone loss. Ok it seems the Lelhe one is true bypass. This means I don’t have to worry about any tone loss. Right? I noticed that the Lehle P-Split might actually be what I want as I don’t necessarily need to switch amps. Hmm...but I guess the option of having to single out an amp would be good. Haha! Ok so after much reading it seems I DO need a buffer and the Twin City has that function where I can increase the amount of ‘buffer’. Cool! Sounds like that’s the one to get. Excellent piece of kit. Love Radial stuff. Have you seen the Tonebone version? Is it the same one in a different box? 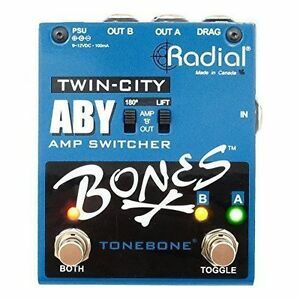 The Twin-City is the Tonebone version. They have a new paint scheme. Both are blue. Scrumm’s post above is the older one. I’ve always got good results from this guy..
It’s the unpowered version. I don’t play at band volume anymore so this does the job quite well IMHO. I think I want the buffered twin city. Lehle is probably the best thing going for non-rack switchers these days. And you'll pay for it. Honorable mention for the Whirlwind Selector - Made in USA version. I can't comment on the Chinese made units. A bunch of Pro's still use this pedal and an absolute steal on the used market. Unfortunately the Lehle doesn’t have the buffer I need. The one that does is pricey. I haven’t seen a better deal than the Radial. 2012 EVH Wolfgang Special • USA Specs • Stainless Frets • Hard Case • $575 Shipped!